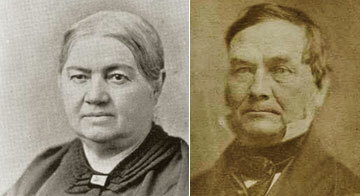 The Society holds the papers of these two prominent settlers who participated in the birth and growth of Wisconsin over the course of the 19th century. If you have questions about the Henry and Elizabeth Baird Collection, please contact our Archives Reference Services staff by phone at 608-264-6460 or by email. See a complete box-by-box inventory of all Baird papers in the Archives available for research. Read a historical essay about the Bairds. Read Elizabeth Baird's memoir of coming to Green Bay as a teenage bride in 1824. Read about Henry Baird's life in this article by E. H. Ellis written in 1876.